In a fun-filled and warming Monday morning student assembly, Rowland Elementary School invited Superintendent Linda N. Reid to help honor those students who have been “caught-being-bright,” as part of the Positive Behavior Intervention Support (PBIS) Initiative. Approximately 40 students were honored at all grade levels by Mrs. Reid for either being “BRIGHT” or for the 100 Book Challenge. BRIGHT is an acronym for a variety of reasons why students can be identified for their positive behavior, where “B” stands for Being Honest, “R” stands for Respond Appropriately, “I” stands for Improve through goals, “G” stands for Give Respect, “H” stands for Help Others and “T” stands for Try your Best. 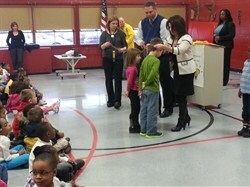 This is a weekly ceremony that Rowland hosts to honor well behaved students.